I absolutely love BBQ’s, cooking outdoors and making a meal into a real social occasion. Good food, good company and maybe even the odd glass of wine. 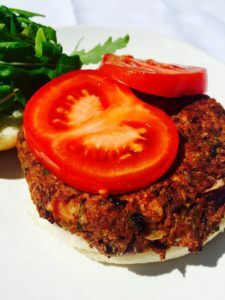 Traditionally though, BBQ’s are very meat heavy and in this new era of trying to eat less meat for the sake of the environment, our health and our pocket, I’ve been exploring some meat free options. Whilst you may not want to go completely meat free, try reducing the amount of meat you BBQ by replacing some of it with these alternatives. Use veggies such as peppers, courgette, aubergines, red onions, mushrooms and cherry tomatoes. Add some chunks of haloumi cheese for extra flavour. 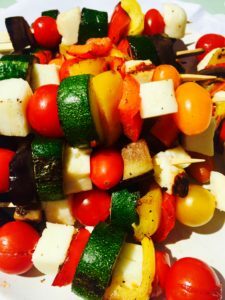 Haloumi cheese is a great cheese for the BBQ as it stands very high heat. Drizzle with olive oil and BBQ over a low heat. I always think this looks great and usually goes down very well with kids. Rub some butter on the corn and wrap the cobs in foil, twisting the end. Place on the heat and when you hear it sizzle after about 10 minutes, turn it over. It should be ready after 20 – 25 minutes. If you cook it in foil, it will keep warm for about another 25 minutes. Alternatively, you can boil the cobs first for up to 10 minutes, depending on how soft you like the corn and finish off on the BBQ. Remember not to add any salt to the water as this will make the corn tough. These are delicious and really easy to do. You can buy bags of sweet peppers. Just cut the peppers in half and de-seed. 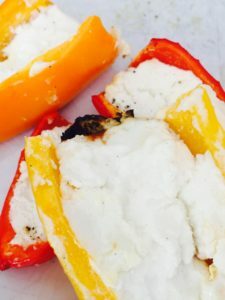 Fill the inside of the pepper with some soft goats cheese and grill on the BBQ, pepper side down. These work well on the BBQ, or you can do the same thing under a hot grill. Slice them lengthways about 1/2cm thick. Sprinkle with some olive oil, balsamic vinegar and a little lemon juice. To make them go nice and soft on the inside, leave them to marinade for about one hour. Cook on the BBQ until slightly charred on the outside. Boil the new potatoes until they are just tender. Drain and toss with some olive oil, a clove of garlic, salt, pepper and some fresh rosemary. Wrap them in a large piece of tin foil and make a parcel. Place on the BBQ for about 25 minutes, turning occasionally until they have crisped up on the outside. It is best to start these off in the oven (200°C for 40 minutes) first as they will take a long time on the BBQ. Drizzle over some olive oil and sprinkle with a little salt. Wrap tightly in 3 layers of foil and place over the heat for 30 – 40 minutes turning frequently so they cook evenly. Sliced haloumi cheese is also great grilled with a little lemon juice. Wrap up some delicious breads such as ciabatta, garlic bread, olive bread, rosemary bread etc in tin foil and place on the BBQ at the side away from direct heat for about 10 minutes. Don’t forget that as a great alternative to meat, fish is absolutely delicious on the BBQ. 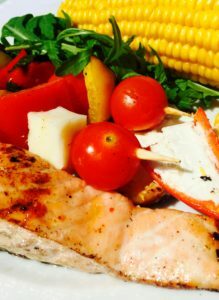 You don’t need to BBQ an entire fish, just try salmon fillets if you’re looking for something simple and straightforward. Drizzle with a little sauce of your choice such as sweet chilli sauce or even just lemon juice and cook for a few minutes on each side. I know if you’re a meat eater, that you’ve probably just pulled a face at the idea of a bean burger. They don’t always get a good press and many of the bought ones are pretty uninspiring. So please put aside you preconceptions and say hello to the Spicy Mexican Bean Burger. A very worthy alternative to the beef burger. Full of spice and taste and it holds together well on a BBQ. Click here for the full recipe. So I hope that’s given you some fresh ideas for the BBQ. Lets just hope now that the weather holds up!